Once upon a time, I had a game called Wag the Wolf. It was a good game, but its rules were too dense for its gameplay, and the whole thing wound up being less than the sum of its parts. So as I may have mentioned in the past, I’ve been taking various bits of Wag worth saving and putting them in new games. One of the coolest parts of Wag was its brutal, evil auction. I built a new game around that auction, based on some ideas about the military-industrial complex I had at the time. That game, PaxRobotica, grew to the point where its focus was its other mechanisms, and I recently decided to remove its auction. So now I have this great auction, and a blank slate on which to plate it. Hence, MacGuffin Market. To determine if the story is using a MacGuffin instead of another plot device, check if replacing the item with another would make relatively little differences to the core plot. For example, in a crime story, the MacGuffin could be the Mona Lisa, a large diamond, a bank vault, a computer terminal, or a museum artifact; the story would be exactly the same. It doesn’t matter what specific power or value the item possesses, only that there is a desire for the characters to possess it. In so many games, the players are simply after MacGuffins. It doesn’t matter if it’s silk from 16th-century Venice, or a robot translator from 25th-century Alpha Centauri. So this game’s theme reflects my frustrations about theming a game where I’ve already set up the mechanisms. I could’ve pasted on a theme, but it would have resulted in a dry and somewhat dishonest game. So I threw up my hands and gave up. The game is about MacGuffins. The players are bidding on items that have no value within the game, other than VP. I’ve defined them within the game as “beeping black boxes” or “big honkin’ gems.” That’s the best I can do, I think, because if I made it about collecting cars or diamonds, it would’ve felt like every other game out there with a pasted-on theme. This is a good thing, because I was very upset about the game for awhile. I actually didn’t enjoy it, and was stunned when my playtesters did. Once I realized I could keep the theme and play off the idea of the players going after silly items, I relaxed and realized that I might have something here. The auction was never a worry; I know the auction works. For those who don’t, it’s pretty simple. A player makes a bid on the bid track, and slides a bid pointer so its “High Bid” arrow points to his bidding pawn. This bid marker also has a number of “Underbid” arrows, but the total number of High Bid and Underbid arrows is always one less than the number of players. So players can underbid the high bid and remain in the auction, although the high bidder will always get the spoils. What are the spoils? Turn order is the first one. 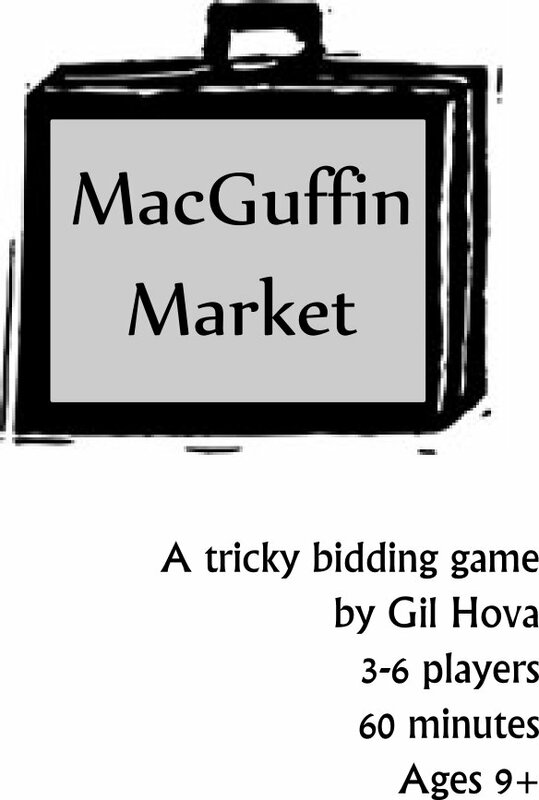 The auction winner has the first crack at buying a MacGuffin, which gets him VP. I want turn order to be critical in this game. The second spoil is gems, which is a brand-new addition. Previously, the auction winners received VP, but that just didn’t seem right. Under the newest ruleset, the winning bidders get gems, with the highest bidder getting the most. They can cash these gems in for MacGuffins instead of using money, and in fact, the exchange rate of gems to MacGuffins is better. This solves the problem of a player bidding his wad of cash at the auction and not having enough to buy MacGuffins afterwards. Instead of buying MacGuffins, players can also take Bonus cards, which give them special powers during the games. Finally, players can take an Income chip, which is how one makes money in this game. The only thing is that taking an Income chip ends your round. The game takes five rounds, and runs about an hour. I’m aiming for it to fill the same niche as a game like St. Petersburg; a pleasant and quick economic game.